^ 一九七五年四月二十二日 第389（1976）号决议. 联合国安理会第一九一四次会议. 1975年. （原始内容存档于2016-03-26）. ^ 2002年，来自14个国家的超过125名妇女共同签署了一份声明，呼吁建立一所国际法庭。另有其他组织发表了诸如此的要求，包括东帝汶和印度尼西亚行动网络（美国）, TAPOL , 以及提出先决条件的人权观察和大赦国际 互联网档案馆的存檔，存档日期2009-08-08..
^ Payaslian, Simon. 20th Century Genocides. Oxford bibliographies. ^ Genocide Studies Program: East Timor. Yale.edu. 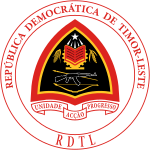 ^ 东帝汶国家文件（East Timor Country Profile. 联合王国外交及聯邦事務部. 2008 [2008-02-19]. （原始内容存档于2008年1月6日）. ^ Budiardjo and Liong, pp. 3–5; Dunn (1996), pp. 28–29; Taylor (1991), p. 20. ^ 出自 Taylor (1991), p. 20; 相似的印尼政府的保证出自 Ramos-Horta, pp. 63–64. ^ 出自 Kohen and Taylor, p. 3. ^ 20.0 20.1 20.2 结束450年殖民统治 回顾东帝汶独立建国之路(组图). 搜狐新闻（来自南方网）. 2002年5月26日. ^ 出自 Dunn, p. 60. ^ 25.0 25.1 Schwarz (1994), p. 208. ^ Ramos-Horta, p. 53–54; 乔利夫证实了拉莫斯·奥尔塔的抗议。（Jolliffe confirms Ramos-Horta's protests.） p. 116. ^ Jolliffe, p. 164 and 201. ^ Indonesia (1977), p. 35; Jolliffe, pp. 179–183; Taylor (1991), pp. 62–63. ^ Jolliffe, pp. 201–207; Taylor (1991), p. 63. 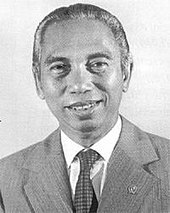 ^ The Polynational War Memorial: EAST TIMORESE GUERILLA VS INDONESIOAN GOVT. War-memorial.net. ^ 45.0 45.1 Indonesia (1977), p. 39. ^ Hill, p. 210; Budiardjo and Liong, p. 15; Ramos-Horta, pp. 101–102, 108; Taylor (1991), p. 68, 69; Dunn (1996), p. 253. ^ Ramos-Horta, pp. 105–106; Krieger, p. 123. Ramos-Horta recounts the linguistic debate at the UN over whether to use "deplore" (a milder term) or "condemn" the invasion. ^ Clark (1995), p. 73. ^ Taylor (1991), p. 177. ^ 联合国大会. 37/30. 东帝汶问题 (PDF). 1982年11月23日. （原始内容 (PDF)存档于2014年8月10日）. ^ 联合国大会第四委员会. 一五四一（十五），附件原则玖. 据第四委员会决议报告书通过之决议案. 第九四八次全体会议. 1960-12-15. （原始内容存档于2016-11-06）. ^ Clark (1995), pp. 73–80. ^ Clark (1995), pp. 92–95. ^ Jolliffe, p. 289; Taylor (1990), p. 9; Dunn (1996), p. 264; Budiardjo and Liong, p. 96. 作者Budiardjo和Liong在书的11页上写道, 公民大会体现民主是 "很荒谬的说法". ^ Paul R. Bartrop, Steven Leonard Jacobs. ‪Modern Genocide: The Definitive Resource and Document Collection‬: ‪The Definitive Resource and Document Collection‬. ABC-CLIO. 2014年: 835. ISBN 9781610693646 （英语）. ^ Taylor (1990), p. 85. ^ Dunn (1996), pp. 275–276; Taylor, pp. 85–88; Budiardjo and Liong, pp. 27–31. ^ Taylor, pp. 100–110; Budiardjo and Liong, pp. 127–138; Jardine, pp. 52–59; Kohen and Taylor, pp. 69–91; Amnesty (1985), pp. 20–78. See also generally Turner and Winters. ^ Budiardjo and Liong, pp. 135–138; Jardine, p. 55; Taylor (1991), pp. 105–106. ^ Taylor, pp. 101–102; Nevins, p. 30; Budiardjo and Liong, pp. 127–128; Amnesty (1985), p. 23; Dunn, p. 299. ^ 89.0 89.1 Amnesty (1995), p. 14. ^ 94.0 94.1 Kohen and Taylor, pp. 54–56. ^ 人權觀察組織. "East Timor-Guerrilla Attacks". 纽约: 人权观察, 1997年6月4日1997. Online at Human Rights News. Retrieved 2 February 2008. ^ 110.0 110.1 Jardine (1999), p. 62. ^ 参见OCLC 08011559、OCLC 12428538、OCLC 15045705和OCLC 27301921. ^ 122.0 122.1 Marker (2003), p. 10. ^ Carey, p. 51; Jardine, p. 16.葡萄牙团队组织 A Paz é Possível em Timor Leste为大量屠杀受害者编译了a careful survey的名单，其中271人死亡, 278人受伤以及270"失踪". ^ Hyland, Tom: "Jakarta 'sabotage Timor visit'" 互联网档案馆的存檔，存档日期2006-09-17., 世纪报（澳大利亚）, 28 October 1991. Read at Hamline University Apakabar Site. URL Accessed 26 August 2006. ^ Pinto, p. 183; Alatas, p. 57. ^ Goodman, Amy and Allan Nairn. "Massacre: The Story of East Timor". 1992. Excerpted at Democracy Now, 28 January 2008. Retrieved on 14 February 2008. ^ 132.0 132.1 Jardine, pp. 67–69. ^ 136.0 136.1 Dunn (1996), p. 303. ^ "Indonesia/东帝汶: 东帝汶人权的恶化"。人权观察组织。1995年2月。Retrieved 16 February 2008. ^ Abrams, Irwin. "The 1996 Nobel Peace Prize". 1996. Retrieved on 16 February 2008. ^ Kroon, Robert. "Q&A/Ali Alatas, Foreign Minister: Jakarta Goal for East Timor: Autonomy". 国际纽约时报. 3 February 1999. Retrieved 16 February 2008. ^ 147.0 147.1 Nevins, p. 82. ^ "Howard pushed me on E Timor referendum: Habibie" – 澳大利亚广播公司 ABC News (Australia) 16 November 2008. ^ 都出自 Nevins, p. 91. ^ 出自 Nevins, p. 92. ^ 安吉利·沙（Shah, Angilee，国际公共广播电台记者，journalist at Public Radio International "Records of East Timor: 1999" 互联网档案馆的存檔，存档日期2008-01-02.. 2006年9月21日. 加利福利亚大学洛杉矶分校国际学院 在线 2008年2月17日恢复. ^ "Wiranto – survivor with iron will". BBC News. 2000年2月13日.在线于 bbc.co.uk. 2008年2月17日恢复. ^ 161.0 161.1 Nevins, pp. 108–110. ^ 165.0 165.1 165.2 《帝汶信息服务》第1期（TIMOR INFORMATION SERVICE Number 1.） (PDF). 澳大利亚. 1975年11月11日 （英语）. ^ East Timor. The Western Australian. 29 November 1975. ^ Australians evacuated; Dili waits. The West Australian. 4 December 1975: 1. ^ Horta blames Australia for blood shed. The West Australian. 5 December 1975. ^ 169.0 169.1 169.2 169.3 169.4 Schwarz (1994), p. 207. ^ Dunn (1996), p. 345; Jardine, pp. 46–47; Taylor (1991), p. 170. ^ Treaty between Australia and the Republic of Indonesia on the Zone of Cooperation in an Area between the Indonesian Province of East Timor and Northern Australia. Australasian Legal Information Institute - Australian Treaty Series 1991. 1991 [2008-10-20]. ^ Nevins, pp. 62–64; Dunn (1996), pp. 348–349; Chinkin, p. 286; Taylor (1991), pp. 170–171; Kohen and Taylor, p. 107. ^ Dunn (1996), pp. 19–22; Wesley-Smith, p. 85; Jardine, p. 22. ^ Paul Keating – Australia's PMs – Australia's Prime Ministers. Primeministers.naa.gov.au. ^ In office – Paul Keating – Australia's PMs – Australia's Prime Ministers. Primeministers.naa.gov.au. ^ Fitzpatrick, Stephen. Downer signs new Jakarta treaty. The Australian. 14 November 2006. ^ 180.0 180.1 180.2 存档副本. [2014-10-19]. （原始内容存档于2010-09-23）. ^ 曹兴. 东帝汶独立过程中的宗教认同. 中国民族报（中国民族宗教网）. 2012-03-20. （原始内容存档于2015-02-16） （中文）. ^ Benedict Andersen, "East Timor and Indonesia: Some Implications", paper delivered to the Social Science Research Council Workshop on East Timor, Washington, DC, 25–26 April 1991 cited in Schwarz (1994), p. 207. ^ 187.0 187.1 Pilger, John. "Blood on Our Hands" 25 January 1999. Online at johnpilger.com. Retrieved 2 February 2008. ^ 189.0 189.1 189.2 East Timor Revisited. Gwu.edu. ^ "Report: U.S. Arms Transfers to Indonesia 1975–1997". World Policy Institute. ^ "East Timor truth commission finds U.S. "political and military support were fundamental to the Indonesian invasion and occupation". George Washington University. ^ Nunes, Joe. East Timor: Acceptable Slaughters. The architecture of modern political power. 1996. ^ Archived copy. [2008-02-21]. （原始内容存档于6 March 2008）. "Human Rights Are Not an Issue". Mother Jones. Retrieved 21 February 2008. ^ Defert, Gabriel, Timor Est le Genocide Oublié, L’Hartman, 1992. Dunn, James. Timor: A People Betrayed. Sydney: Australian Broadcasting Corporation. 1996. ISBN 0-7333-0537-7. Friend, T. Indonesian Destinies. Harvard University Press. 2003. ISBN 0-674-01137-6. Horner, David. Making the Australian Defence Force. The Australian Centenary History of Defence. Volume IV. Melbourne: Oxford University Press. 2001. ISBN 0-19-554117-0. Marker, Jamsheed. East Timor: A Memoir of the Negotiations for Independence. North Carolina: McFarlnad & Company, Inc. 2003. ISBN 0-7864-1571-1. Martin, Ian. Self-Determination In East Timor: The United Nations, The Ballot and International Intervention. International Peace Academy Occasional Paper Series. Boulder: Rienner. 2002. Nevins, Joseph. A Not-So-Distant Horror: Mass Violence in East Timor. Ithaca, New York: Cornell University Press. 2005. ISBN 0-8014-8984-9. Smith, M.G. Peacekeeping in East Timor: The Path to Independence. International Peace Academy Occasional Paper Series. Boulder: Rienner. 2003. Taylor, Jean Gelman. Indonesia: Peoples and Histories. New Haven and London: Yale University Press. 2003. ISBN 0-300-10518-5. Vickers, Adrian. A History of Modern Indonesia. Cambridge University Press. 2005. ISBN 0-521-54262-6.